That was pretty fast. 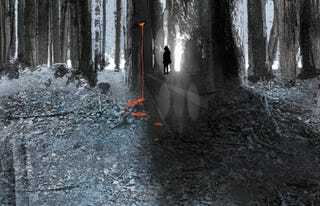 After debuting at New York Comic Con, Wytches has been picked up by Brad Pitt's production company Plan B. Keep an eye on Plan B, since they've picked up a fair number of genre projects since partnering with New Regency. Plan B's producing team of Brad Pitt, Dede Gardner and Jeremy Kleiner have produced World War Z, and are currently in development on an adaptation of Charles Burns's graphic novel Black Hole and the thriller 3 Videotapes. Wytches follows Charles Rooks, a loving father who moves his family to a neighboring town in an attempt to help their teenage daughter Sailor recover from a disturbing run-in with a bully. She remains haunted by the traumatic incident, unsure of what actually occurred in the woods and unable to escape a darkness growing around her. When Sailor begins to see familiar shadowed figures, Charles must help his daughter survive a terrifyingly real and mythic presence rooted within the woods and the surrounding local towns.